We all whine there aren't enough wagons...boo-hoo why can't I find a cool wagon? And when you do find a wagon..it has a damn automatic. Well the day has come fellow Jalops, the day when one of you takes home this 2004 Passat W8 6 speed 4motion (AWD) with only 80,000 miles. It can be yours for only only $10,000. O.k. so 10 large isn't exactly cheap for a ten year old VW with 80k on the clock, but let's re-cap the positives: wagon, 8 cyl, AWD, manual transmission and IT'S A FRIGGIN' WAGON! Also, it seems the owner is fairly serious about that price and the fact that you should appreciate this car...because you should dammit. If you're reading this you know how unique this vehicle is. 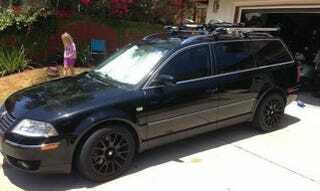 If you don't know or have never heard of the infamous Volkswagen Passat W8 4MOTION, then move on. They only made 100 sport 6-speeds. 6-speed manual, AWD, leather & loaded. Just put new tires and CV joints. This is a collector and will only increase in value. It's always been a 3rd car and used sparingly with only 80,000 miles. Custom wheels and tinted windows. No test drives without deposit & emails or texts with "offers" will be deleted as well. Happy to discuss offers in person. This might not be exactly the wagon you want...but it's the wagon you need.